Morning Star backs Nicaraguan regime repression against accusations of human rights violations. 39th Anniversary of Nicaraguan Revolution: Regime Chief Says Bishops in “Coup Plan”. Nicaragua strongman blames ‘satanists,’ bishops, U.S. for unrest. Agence France-Presse July the 20th. Daniel Ortega says the protesters, financed by the ‘North American empire’ and domestic business chiefs, had been conspiring to mount a coup d’etat against him. “The satanists have to be exorcized,” he said. “It has been a painful battle. Painful because we have confronted an armed conspiracy financed by internal forces we know and external forces,” he said. The 3 months of unrest in what used to be one of Latin America’s safest countries has seen more than 280 people killed, most of them protesting youths, according to rights groups. Le Monde today is moved to Editorialise on the anniversary speaking of the regime’s moral disarray and excessive use of force (“déroute morale, provoquée par un usage excessif de la force”). The Spanish language press has talked for some time of the violence of Ortega’s henchmen, the “turbas sandinistas“. Faced with the mounting violence most of the international left has backed the protests against the corrupt Nicaraguan regime’s bloody repression. June 21, 2018 US Socialist Worker (no relation at present with UK publication of the same name). The two-month old uprising in Nicaragua against the government of President Daniel Ortega and Vice President Rosario Murillo (Ortega’s wife} has turned into a city-by-city battle for control. Students began the protests with opposition to cuts to Social Security, but now, the chief demand of the spreading movement is the resignation of the Ortega-Murillo government. At one point, the government seemed to teeter, but government-backed paramilitary forces are waging a campaign of terror to intimidate the population into submission. Meanwhile, the government is negotiating with a fractious grouping of opposition representatives in an effort to resolve the crisis. Ortega has indicated he may be willing to accept early elections in 2019, but not leave power any sooner. But it’s unclear whether this is a sufficient concession to demobilize the anti-government protests. Oscar René Vargas is a Nicaraguan sociologist and political analyst who was a militant in the Sandinista revolution, and is now a critic of the political and moral degeneration of the FSLN and the Ortega government. This article first appeared in Correspondencia de Prensa and was translated by Lance Selfa. The Guardian reports today, Tom Phillips: Nicaragua: what’s driving the uprising and what comes next? Nicaragua celebrates 39th anniversary of the revolution and defeat of coup attempt. Morning Star July the 19th. A government offensive is underway, dismantling roadblocks that have damaged the Nicaraguan economy and been used to launch attacks against Sandinista supporters and the police. The coup attempt began on April 18 following protests over pension reforms. Mr Ortega announced a national dialogue backed by most layers of Nicaraguan society including trade unions and the country’s official student body. 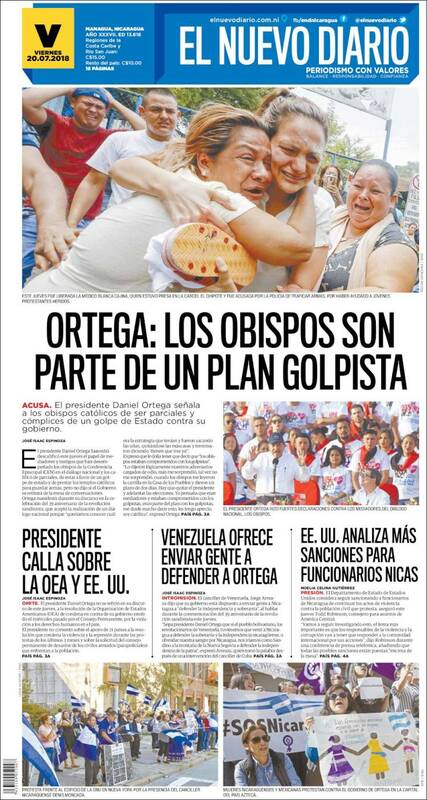 Despite this, opposition groups continued to wage violent attacks, demanding the resignation of Mr Ortega. On Sunday an arsenal of weapons, including bomb-making equipment and home-made mortars, was found at the occupied National Autonomous University of Nicaragua. Fearing potential attacks on today’s celebrations, critics warned that international organisations have sided with the coup-plotters. They accused Amnesty International and “fellow coup apologists” such as Bianca Jagger and SOS Nicaragua, along with media organisations including the Guardian, BBC, Telegraph, Washington Post, New York Times, Al Jazeera and CNN of covering up human rights violations committed by opposition activists trying to oust Nicaragua’s legitimate government. This article is far from alone in the self-styled Paper of the Left’s coverage. HUGE cache of arms has been found at the National Autonomous University of Nicaragua (UNAN) as the Sandinista government launched an offensive against armed right-wing terrorists over the weekend. Morning Star. Monday July 16th. Vargas and many, many, others, tell a very different story. It’s time Labour spoke out against this brutal and corrupt regime. « France: Top Macron Minder, Alexandre Benalla, Filmed Hitting May Day Protester. The time to speak out against them was in 1979! But better late than never. See what happens when you support state capitalist, left nationalist regimes? There really is no nice way to run capitalism. I don’t know whether to laugh or cry reading this article. They try hard to paint the protesters in a very negative light. But I did laugh at the bit about the Nicaraguan economy being stable. Surely that is a bad thing as the economy is well…rubbish! So keeping a rubbish economy stable is hardly something to write home about. Next time the Star claims to pro-choice, ask them why they support the party that made abortion completely illegal in Nicaragua. It was always good to embarrass the NSC when they used to speak at union meetings. At the end of their drivel about how Nicaragua is paradise on Earth, you can always say “Thank you for visiting us today, as I know it must have been a tough decision as we are pro-choice…”. It was funny to watch them squirm. But back on topic, since when did the Star ever care about human rights? 1.Immediate new elections to the Soviets; the present Soviets no longer express the wishes of the workers and peasants. The new elections should be held by secret ballot, and should be preceded by free electoral propaganda for all workers and peasants before the elections. 2.Freedom of speech and of the press for workers and peasants, for the Anarchists, and for the Left Socialist parties. 3.The right of assembly, and freedom for trade union and peasant associations. 4.The liberation of all political prisoners of the Socialist parties, and of all imprisoned workers and peasants, soldiers and sailors belonging to working class and peasant organisations. 5.The election of a commission to look into the dossiers of all those detained in prisons and concentration camps. 6.The abolition of all political sections in the armed forces; no political party should have privileges for the propagation of its ideas, or receive State subsidies to this end. In place of the political section, various cultural groups should be set up, deriving resources from the State. 7.The immediate abolition of the militia detachments set up between towns and countryside. 8.The equalisation of rations for all workers, except those engaged in dangerous or unhealthy jobs. 9.The abolition of Party combat detachments in all military groups; the abolition of Party guards in factories and enterprises. If guards are required, they should be nominated, taking into account the views of the workers. 10.The granting to the peasants of freedom of action on their own soil, and of the right to own cattle, provided they look after them themselves and do not employ hired labour. 11.We request that all military units and officer trainee groups associate themselves with this resolution. 12.We demand that the Press give proper publicity to this resolution. 13.We demand the institution of mobile workers’ control groups. 14.We demand that handicraft production be authorised, provided it does not utilise wage labour. you would agree it would be the correct thing to do to shoot them and their families! There are rumours of Venezuelan and Cuban military involvement, alongside the Nicaraguan military long being suspected of being involved in violence, despite professing neutrality. Well I spoke to a woman from the Nicaraguan Solidarity campaign and she loves both Cuba & Venezuela. Does that mean all these solidarity campaign societies will fall out if there is war between these states? I would not have thought Venezuela was in a fit state to wage war against anyone. As for Cuba, what would be in it for them? Nicaragua is dirt poor, one of the worst economies in the World (all the fault of the US of course), so the benefits of conquering that country would be outweighed by the costs. Whoever takes over though, lets hope they life the ban on abortion. Eh comrades? What are you saying Steve? That Stalin would make a better Prime Minister than Theresa May? That the Bolsheviks should take over Buckingham Palace? . Steven, In Nicaragua you can fill up a 60 litre tank for less than one US dollar 😉 Nicaragua is the cheapest place in the world to fill up your vehicle 😉 Enterprising Nicaraguans transport the cheap fuel over the border to Columbia to make a quick buck. And who said the Nicaraguan economy was in tatters? Daniel, is there anything you Central American lefties love more than $$$$$$$$$! Czar Nicolas, even Robert Griffiths would make a better PM than Theresa May. Daniel Ortega, I’ve checked this and petrol is a dollar a litre in Nicaragua. That is more expensive that in Columbia, are you sure you it’s not the Colombians selling it to the Nicaraguans for a cheap buck?